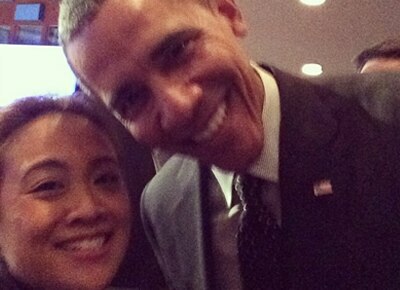 In what could be touted as the selfie to beat this decade by local personalities, Vice President Jejomar Binay's daughter, Anne Binay took a selfie with no less than US President Barack Obama. The photo was posted on Anne's Instagram account on March 25 and has drawn 242 likes and 49 comments as of this writing. Anne was with the Vice President and other world leaders at the Nuclear Security Summit held at The Hague, Netherlands from March 24-25. In another Instagram post, Anne showed her “boss” the Vice President watching her on the side as she struck a pose with the American leader. Most of the comments on the photo were of shock and amazement. 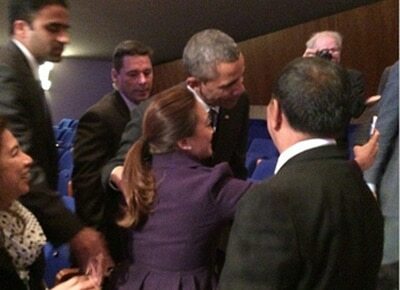 “You're the coolest!” said IG user Nikki O.
Netizens took this photo as a sign of reconciliation between Vice and the lawmaker after the controversy in 2013 wherein the former took a swipe on the latter’s decision to run for office despite her lack of political experience.